Gingham Girl: Fusion Card Challenge's 3rd Anniversary! Fusion Card Challenge's 3rd Anniversary! I was delighted to be asked by my talented stamping friend Michelle Leone to join in Fusion Card Challenge's 3rd Anniversary celebration! Just look at this inspiration photo and sketch, so gorgeous! I was inspired by the gorgeous photo and some elements of the sketch. I included a Nordic print stripe from Claire Brennan's Nordic Winter set (that I believe is now for sale at GinaK Designs), a circle stencil from Heidi Swapp with texture paste for the snow, and little leaves and berries from WPlus9's "Be Merry" set. I cut a tree branch from grey woodgrain paper using a Memory Box die, and added some pine branch die cuts colored with Copics and glittered up with Crystal Snow. 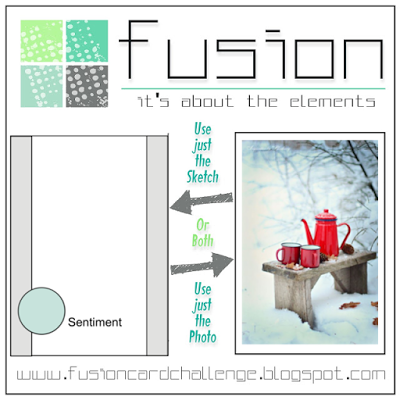 I can't wait to see what the DT members came up with, and to watch the gallery fill up with gorgeous winter creations! Thanks again to sweet Michelle, and a big congratulations to the Fusion team for creating a challenge blog that ALWAYS inspires! This is gorgeous; I love everything about it! Beautiful card, Kelly! The red and white really pop and the touches of soft green add such a sweet look. Thanks so much for taking the time to guest with us a Fusion. It is so appreciated. Oh Kelly, I just love your card!! It's a perfect make someone feel cozy on a cold January day kind of card!! Happy New Year! Red and white delight! This is gorgeous! 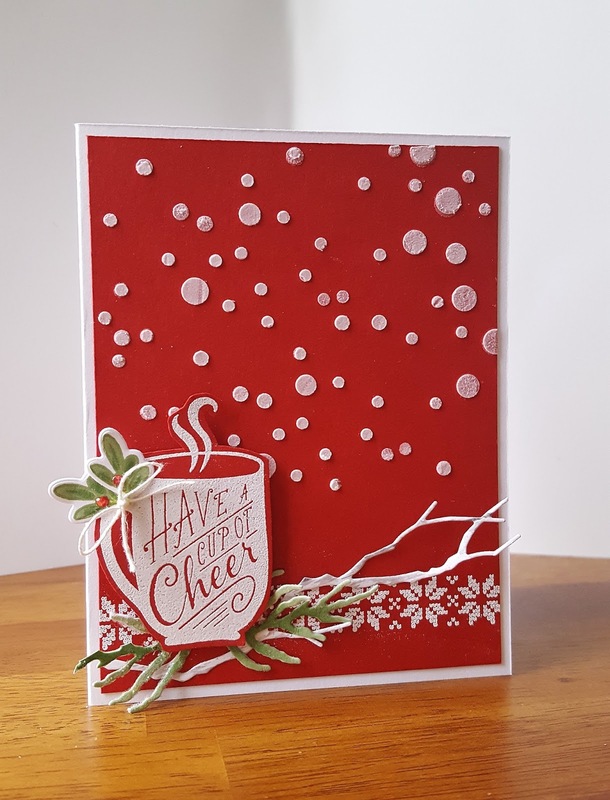 A warm and cozy card for sure! I adore all the texture on your card! Stunning! Your cup of cheer, the nordic print strip, the pine and branch, and the wee sprig of holly are a marvelously lovely combination! The 'wintry wonderland' is such a sweet added touch! So thrilled that you accepted Michelle's invitation to join us at Fusion! Love this, Kelly! It's just perfect! You've really captured a holiday message of coziness and cheer! Age 46, Married with 2 daughters, Speech-Language Pathologist.